Find hotel near Train A Vapeur Des Cevenn .. Contemplating things to do in Anduze with kids? The Train A Vapeur Des Cevennes could be a great choice. A lovely train station that features train rides to take you around the glorious natural beauty of the region, these attraction is indeed one of the best things do while exploring Anduze. The train takes you around for thirty minutes. These thirty minutes are absolutely fun and a reason why you should visit this place! Generally, tourists prefer visiting top attractions of Anduze like Grand Temple Protestant D'anduze. These are few of the top things to do in Anduze. Want to plan a DIY trip? Use Anduze trip planner for the same. Add accommodation and hotels in Anduze that suit your budget including the most recommended ones like Campanile Ales Centre, Ibis AlÃÃÃ‚ƒÂ¨s Centre Ville and RÃÃÃ‚ƒÂ©sidence Les 3 Barbus. Generate executable plans on your own or book the top rated Anduze vacation packages for your visit. Read more on how to reach Anduze. Love this? Explore the entire list of places to visit in Anduze before you plan your trip. Fancy a good night's sleep after a tiring day? Check out where to stay in Anduze and book an accommodation of your choice. 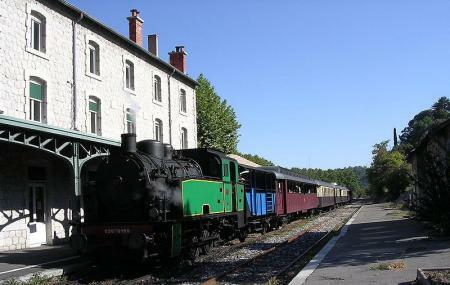 How popular is Train A Vapeur Des Cevennes? People normally club together Musée Cévenol and Temple Protestant De L'eglise Unie De France - Aubussargues while planning their visit to Train A Vapeur Des Cevennes. Great views and well worth the money if making a day trip one direction or the other. Really nice Train ride for 30 minutes. Be prepared for many children (which is fine) - but be also prepared for being ripped off in St. Jean which is a Tourist Trap.